15 Commercial Real Estate & Properties in Campbelltown are listed in 5 categories. We have 7 OfficesSale , 7 Industrial Warehouses Sale , 3 Retail ShopsSale , 2 Development LandsSale and 2 Medical and Consulting PropertiesSale . Combined Commercial are excited to offer this property to the market for both lease and sale. Approx: 77sqm + 14sqm of parking. Suite consists of the below; Reception/waiting room 2 seperate fitted out consulting rooms Kitchen/amenities Ducted air conditioning, alarm, and 1 allocated parking space. Located just off Queen Street, Campbelltown. Only minutes walk away from Campbelltown Station, Campbelltown Court House and shopping centre. Call Carly Lane on 0433 332 782 to arrange an inspection or for more information. DISCLAIMER: Whilst we deem this information to be reliable the agent cannot guarantee its accuracy and accepts no responsibility for such. Interested persons should rely on their own enquiries. Located on busy Queen Street within the heart of the Campbelltown CBD, metres from Campbelltown train station and bus services whilst only a short walking distance to the major Campbelltown Shopping Mall. Improvements consist of a professionally fitted out office space located in the heart of Campbelltown Business District, Currently leased to a Government funded tenant on a long term lease. The suite features ducted air conditioning, alarm, glass partitioned offices, excellent storage, large kitchen/staff room, open workstation area with ample phone/power points, foyer/reception area and amenities. An ideal investment opportunity if you are looking to break into the thriving Macarthur Commercial property market. Contact Darren Zammit 0404 083 445 or Cooper Meehan 0449 904 453 for more details. FIRST TIME OFFERING IN OVER 15 YEARS!! Conveniently positioned retail shop in the heart of Queen Street, Campbelltown. Only minutes walk from Campbelltown train station and bus services and the major Campbelltown Shopping Mall. The property consists of a large glass façade fronting both busy Queen Street and the popular Sky Gardens Plaza. Improvements consist of timber flooring, air conditioning, lunchroom, security shutters plus much more. An excellent opportunity exists for investors to acquire a piece of real estate in one of the best locations within the Campbelltown CBD. Features: 1. Quality tenant. 2. 3+3 year lease. 3. $48,000.00 p.a Net Ex GST. For further information or an inspection, please call Darren Zammit 0404 083 445. Located on the northern side of Rose Street, very close to the intersection of Blaxland Road, Campbelltown. Be amongst the Bulky Goods precinct and only minutes to the M5 & M7 Motorways. Features include: Prime Development site in a tightly held location Relatively level & fully fenced site totalling 10,790m² Zoned B5 Business Development Campbelltown Council Flexible zoning allows a wide variety of uses Surrounding occupiers include Repco, Bing Lee, Harvey Norman and like Significant growth & infrastructure improvements occurring in the Macarthur Region Current holding income Don't miss this opportunity to secure one the last major land holdings in the Campbelltown Bulky Goods precinct. Ideally located on the fringe of the Campbelltown CBD within Warby Street, providing direct access to Campbelltown CBD via Queen Street. Within walking distance to Campbelltown Train and Bus Station along with Campbelltown Mall Shopping Centre only minutes away. The property consists of an existing commercial office with carpeted floors, ducted air conditioning, kitchenette, suspended ceiling, amenities plus two (2) secure underground car spaces. For further information or to book an inspection please call Darren Zammit 0404 083 445. Zoning allows for wide range of retail and service industries Set among major bulky good retailers Situated close to Blaxland Rd, Narellan Rd, Campbelltown Rd & M5/M7 motorway. Short distance to Campbelltown Railway station Currently leased for 3 years with 6 months demolition clause Unlimited development potential All dimensions and figures are approximate. Unless stated, all prices quoted are exclusive of GST. 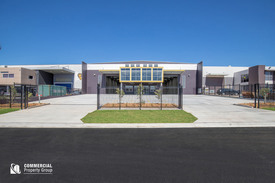 Located in Campbelltown's Industrial precinct within close proximity to both Campbelltown and Narellan Roads M5 on and off ramps. 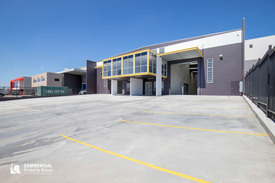 The property consists of a freestanding industrial facility with high internal clearance, container height roller door access, excellent truck access, large partitioned mezzanine office area, plus ample amenities and 27 car parking spaces for both staff and clients. Currently leased until April 2017. For further information or an inspection please contact Darren Zammit. Conveniently located industrial complex only minute and apos;s drive to both Campbelltown and Narellan Road exits from the Hume Highway. 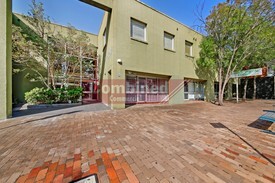 The complex is also within 10 minute and apos;s walk to the Campbelltown railway station and the Campbelltown CBD. Modern concrete panel factory/warehouse, mezzanine office space is partitioned with timber flooring. Access to high clearance factory/warehouse is via container height roller door, a large awning area allows for all weather loading and unloading. Other features include: Onsite car parking M/F amenities Ducted air conditioning Secure fencing 3 phase power Prominent location at the front of the complex Contact Sian McKinley 0417 471 000 or Aaron Ward on 0404 082 445. Located within a specialist medical building on Browne Street only minutes walk to Campbelltown Train Station and the main Campbelltown CBD whilst situated next to Centrelink. First floor suite featuring reception/waiting area, two (2) consultation rooms/offices, BRAND NEW air conditioning unit and suspended ceiling. Currently leased at $15,700.00 gross per annum (ex GST) on a new three (3) year term, commencing January 2017. For further details or an inspection please contact Darren Zammit 0404 083 445 or Cooper Meehan 0449 904 453. Conveniently positioned less than 10 15 minutes walk to all forms of public transport and only minutes drive to the M5 on and off ramps allowing convenient access to and from all areas.This strata unit consists of concrete panel construction with 6 7 metre internal clearance, mezzanine office or storage area, kitchenette, staff amenities, container height roller door along with an onsite cafe.For further information or an inspection contact Sian McKinley or Heather Ross. This property is located in the thriving Campbelltown CBD on the ground floor of the recently renovated Sky Gardens Plaza Building. The property features a reception/waiting area, two (2) partitioned offices, lunchroom/kitchenette and common amenities. The lessee is a local residential real estate agency who are on a 1+1 year lease term. Further investment details are available upon request.